Nerd Block is a subscription mystery box that delivers geeky collectibles right to your door each month. You can choose whatever theme box you are into–there’s the Classic Block, Arcade Block, Sci-Fi Block, Horror Block, Comic Block, and even a Boys Jr. and Girls Jr. Block for younger kids. The sets always includes a t-shirt, along with 4-6 other collectibles that are often exclusive to Nerd Block subscribers. I, of course, chose the Horror Block to try out for a six-month subscription to see what kind of goodies they had to offer. Today we are unboxing the January 2016 Horror Block. 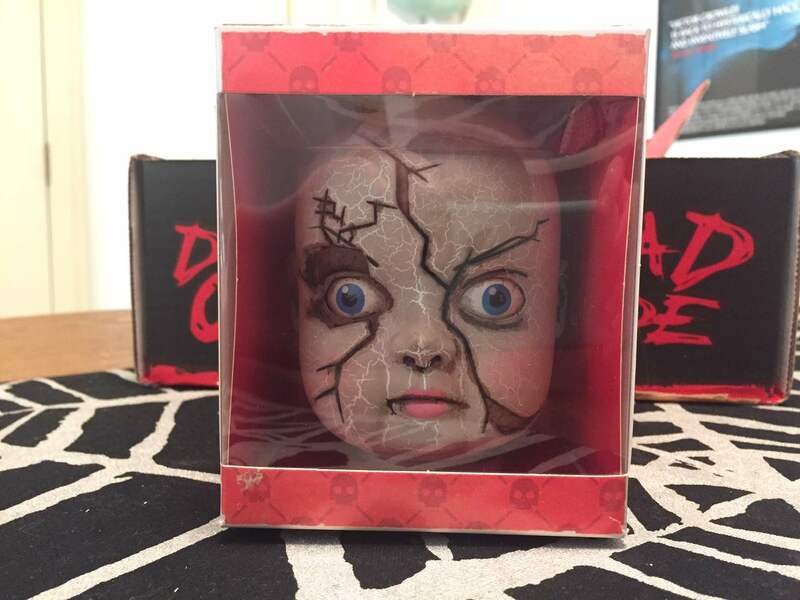 First up, in this block we have one of three exclusive goodies–a creepy plastic doll head. She’s about 3 inches tall and features buggy blue eyes and cracks in her skull that go all the way up to the top of her head. There’s even a hole in the bottom so you can replace your old doll’s normal head with this more fitting horror-themed one, which might just be less creepy than having a random doll head sitting on your bookshelf. Next is unfortunately the most disappointing item in the block. The teases about what we could expect this month promised something from the original Carrie film, which got me very excited because Carrie is one of my favorite features of all time. However, I was totally bummed to find out that the Carrie item was just… a bookmark. 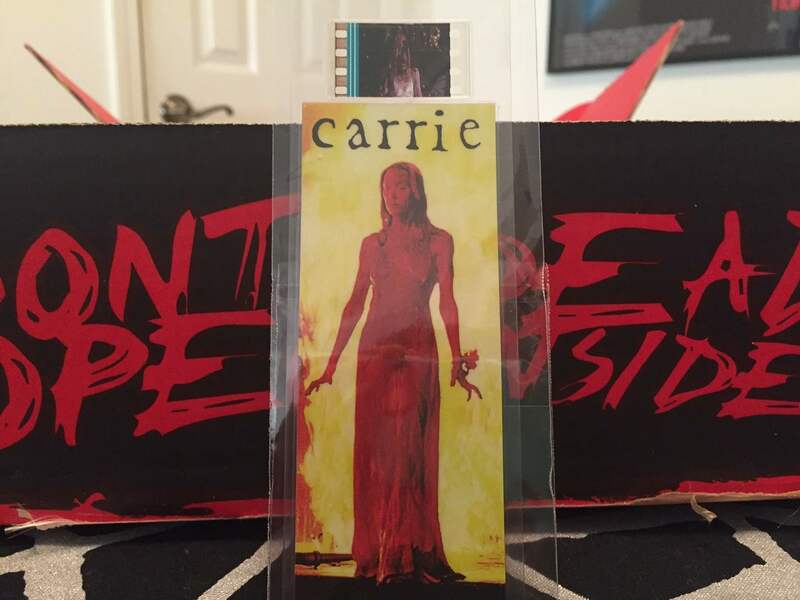 Granted, it is a unique bookmark with a little film cell at the top that shows Carrie after she’s been doused with blood, but I can’t help but feel a little cheated out of what could have been a way cooler collectible from this classic film. Sigh. Things got a little better with this other Horror Block exclusive item, though. 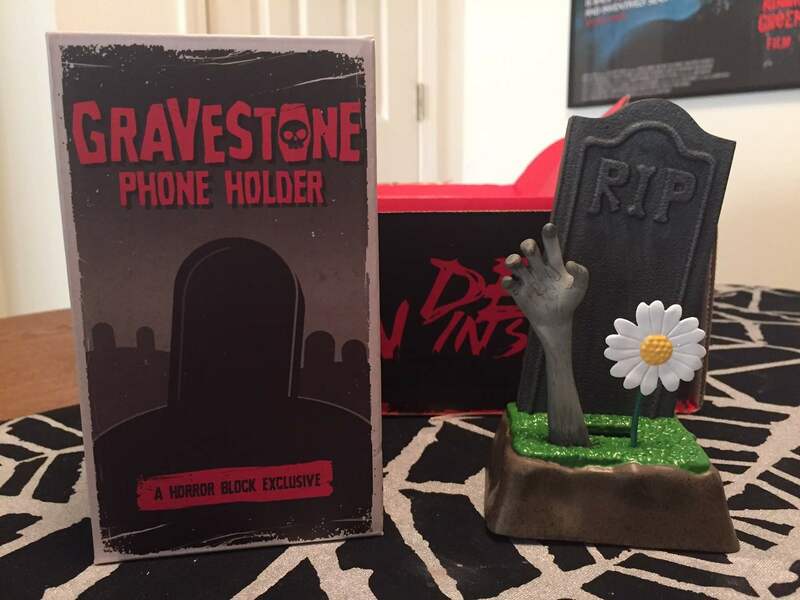 Here we have a headstone cell phone holder, with an undead arm and cheery daisy to cradle your phone while it’s charging. There’s a hole in the bottom and the back for your phone cord. The design of this is pretty cute so I’ll definitely be using it as a more horrific way to stay connected. Yes! Another keychain! 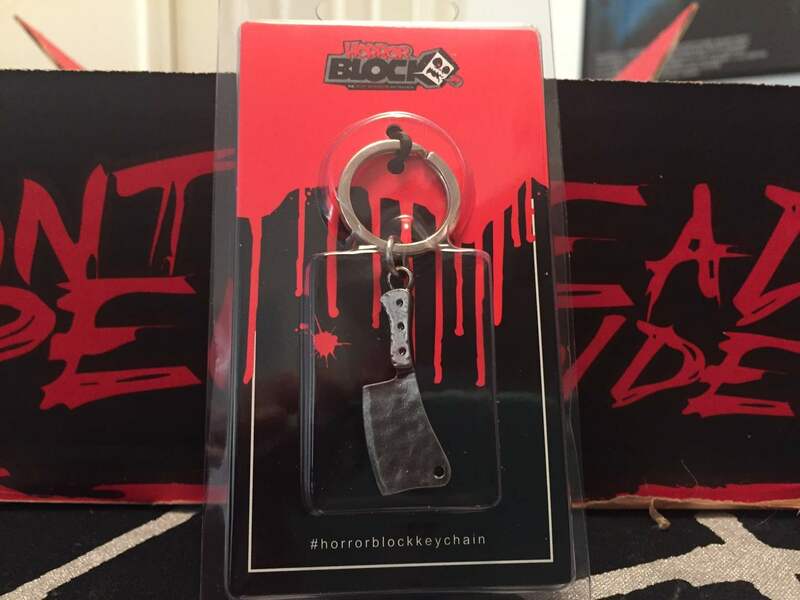 The last of the exclusive items this month is this silver meat cleaver keychain that I absolutely love. The metal makes for a good quality item, and as the description card says, you can also use it as a pendant for a killer necklace or charm bracelet. The edition of Rue Morgue this month is a little different, but still very cool. 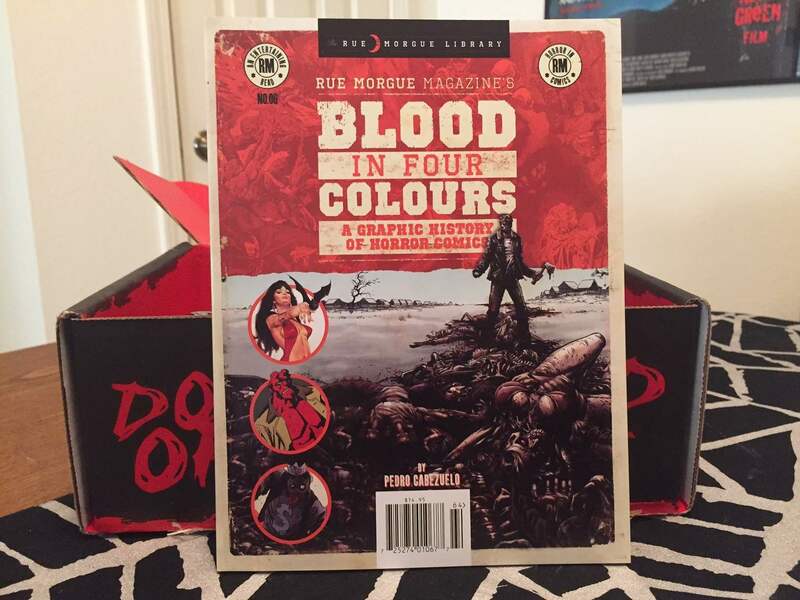 “Blood in Four Colours” swaps out the glossy magazine pages for traditional paper, and the whole edition features a 130-page history of horror comics. Going through by decade, the articles hit on all the different comics that made a splash in horror. Not knowing much about this subject myself, I’m sure this will be a very interesting and informative read. I can’t wait to check it out. Last but not least, there is this month’s t-shirt from ShirtPunch. 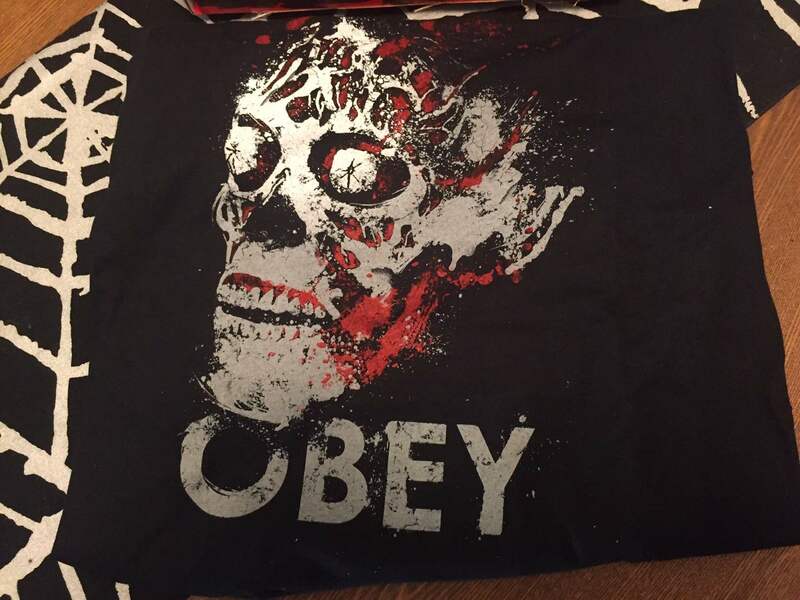 January is the birthday month of legendary director John Carpenter, so Horror Block decided to honor him with this “Obey” t-shirt from They Live. Now I admit that I still have not seen They Live (I know, I’m a bad horror fan) but it’s an iconic image and it’s John Carpenter so this shirt is a win. January 2016’s Horror Block was a tad disappointing to me with not as much horror movie specific items as last month. I really wish the Carrie item had been better, but the cute little random things like the keychain and cell phone holder were a nice touch. I’m predicting something from My Bloody Valentine as a possibility for next month with it being February and all, but who knows? I’ll have to wait and see! If you like what you saw here, head on over to Nerd Block to start your subscription today!